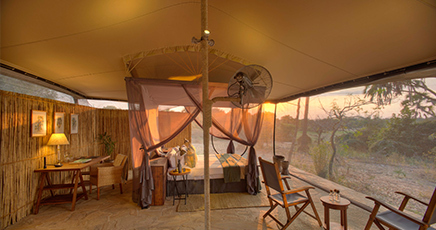 The award-winning Sayari Camp is renowned for extraordinary wildlife sightings and supreme comfort. 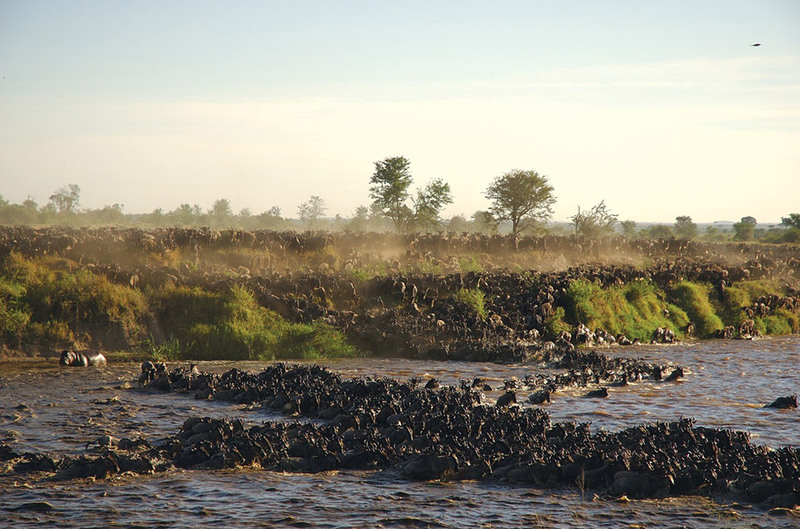 Set on the unspoilt plains of the Northern Serengeti, Sayari gives you easy access to the Mara River and multiple river crossing points in the Serengeti National Park. 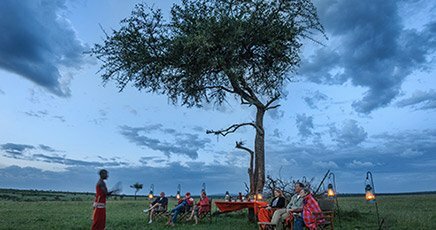 Rates include: Full board accommodation, all house drinks (except champagne), scheduled open-vehicle game drives, short walking safaris, transfers to/from Kogatende Airstrip, laundry service. Families with children aged five and older are warmly welcomed in Sayari Camp. Sayari has been carefully designed to include two mess areas, so you can always find a tranquil, intimate spot and benefit from considerate, personal service. 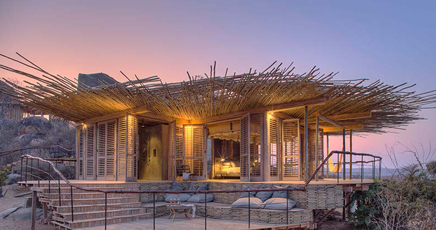 Each has a peaceful lounge and romantic indoor and outdoor dining areas. 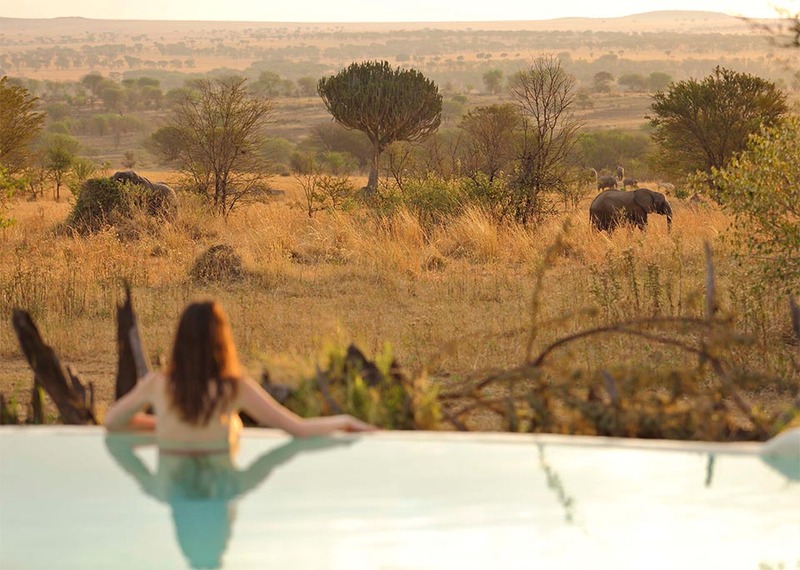 Framed by natural rock formations, the rim-flow swimming pool has impressive Serengeti views – it is the perfect spot to spend a lazy afternoon gazing out over the game-filled plains. 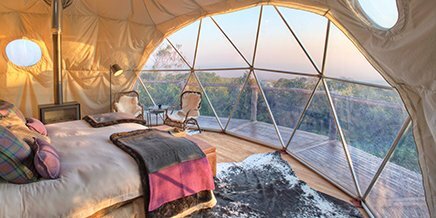 In the evenings, retire to the warmth of the fireplace or the quiet library with a whiskey and share safari tales late into the night. 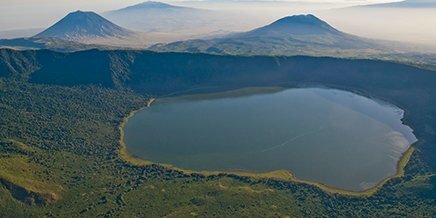 After relaxing in such superb comfort in the world’s premier wildlife reserve, you’ll be rested and ready for all the adventures the next day will bring. Meals at Sayari are wholesome, lovingly prepared and elegantly presented. 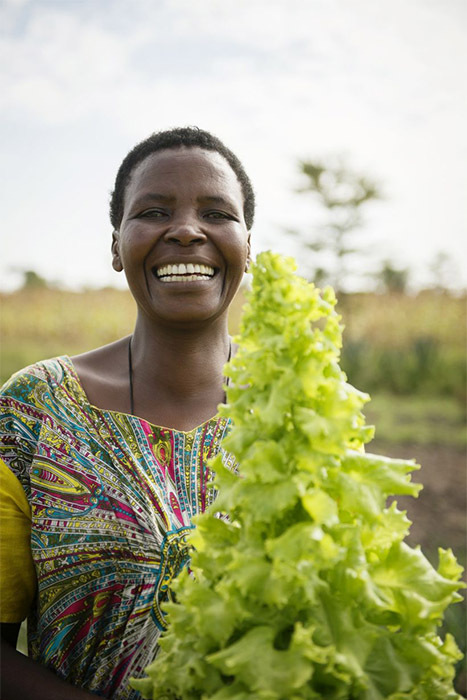 We source most of our fresh produce from local farms in Nyamakendo, Mbalibali and Merenga villages as part of Asilia’s Taste of Serengeti project. 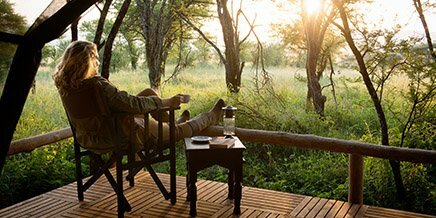 Our breakfasts – which can be enjoyed in camp or out in the bush – include continental or full English breakfast options. The light buffet lunch spreads include a choice of salads, freshly baked breads and warm main course. 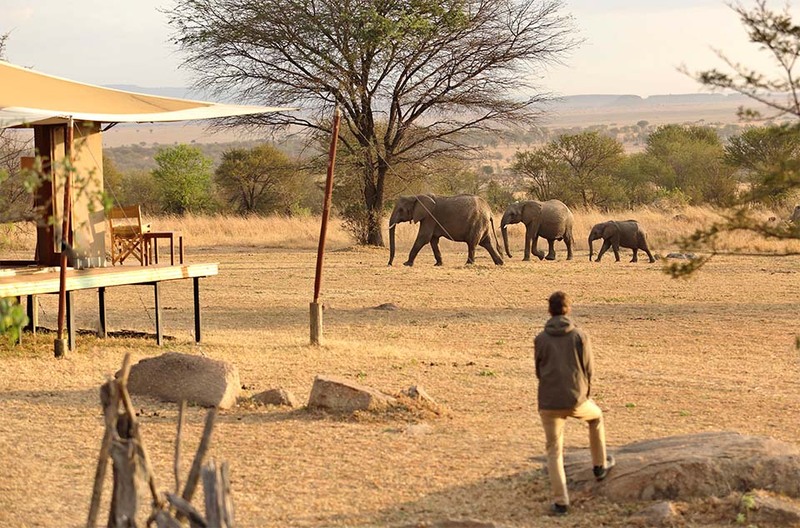 If you are doing a full-day safari, you may choose to have lunch sent out to you to enjoy alfresco in the bush. 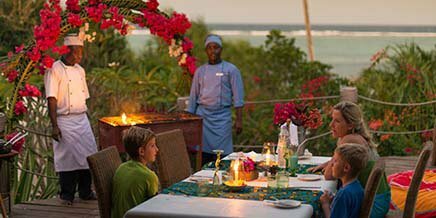 The three-course dinners are delicious, elegantly plated meals with a choice of starter, main course and dessert. 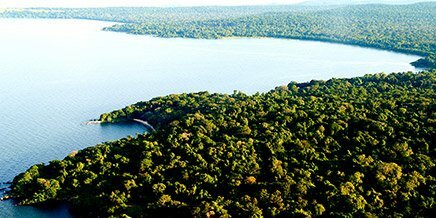 The minimum age at Sayari Camp is five, although exceptions can be made depending on camp occupancy – please chat to us and we will make every attempt to meet your needs. 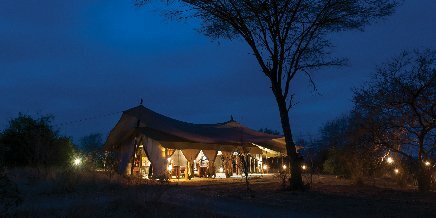 Sayari has three triple tents for up to three family members, alternatively children are accommodated in their own tent. 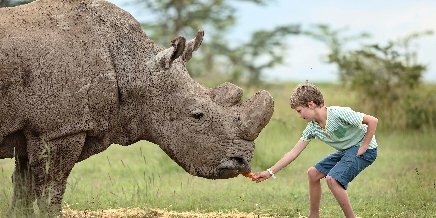 We love catering for the individual needs of families, however safety is always our top priority and the wilderness environment at Sayari is not conducive to providing a specific outdoor activity programme for children. 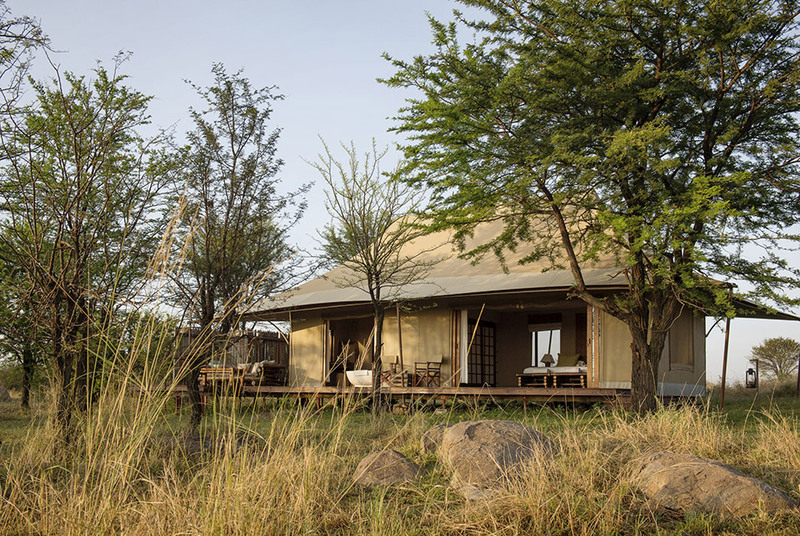 The remote and starkly beautiful landscape of the Northern Serengeti inspired the design of Sayari’s 15 tented suites. These are a subtle mirror of the iconic flat-topped volcanic Turner Hill to the north. 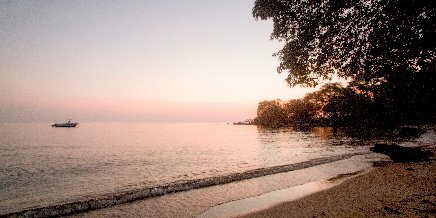 Inside, the rich mahogany floors and delicate tones of sand, stone and acacia reflect the hues and textures of the natural terrain. 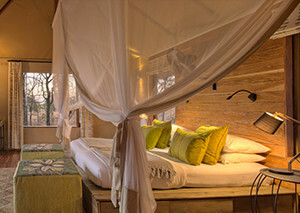 Each expansive suite has a king-sized bed (twin beds available) with fine linens and safari-chic decor to offset the wilderness just beyond the canvas walls. 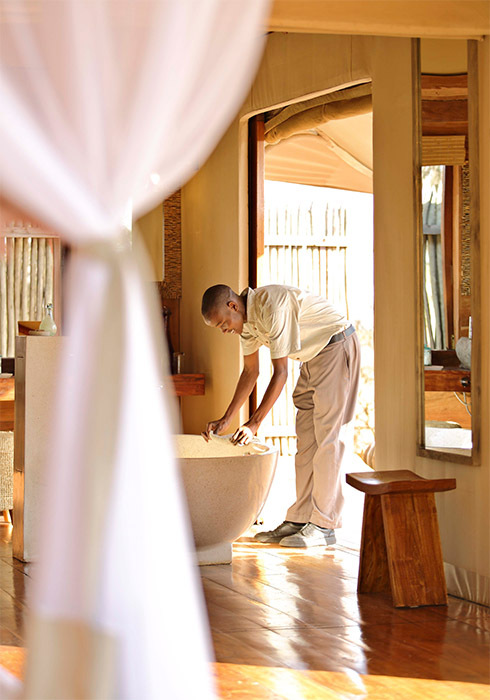 The en-suite bathrooms with walk-in shower and egg-shaped bathtub overlook the Northern Serengeti plains, as do the beautiful private verandas outside. 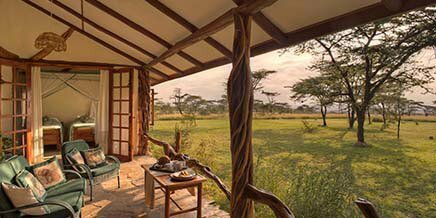 The Northern Serengeti is heralded as one of the prime game-viewing areas in East Africa, and Sayari Camp is at the heart of the action. 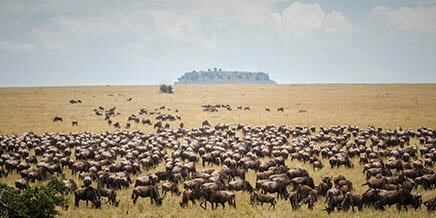 From July to November, great herds of wildebeest gather on the banks of the Mara River on their journey north, ready to brave the crocodile-infested waters and the hungry predators on the other side. 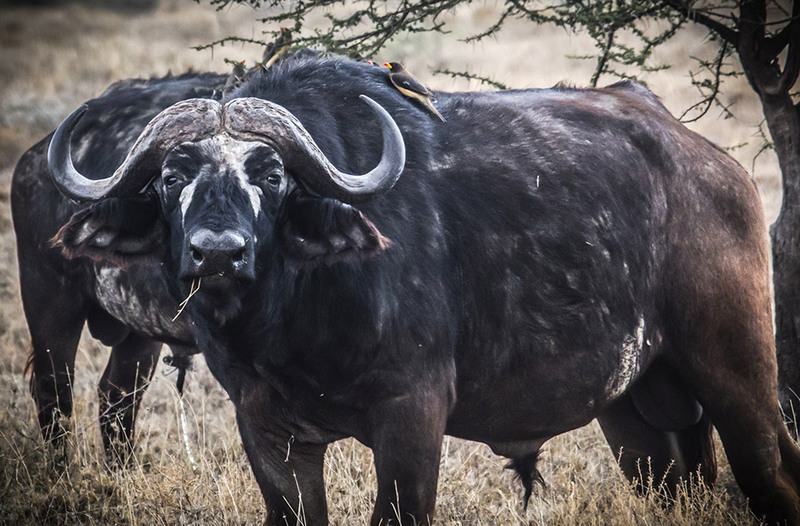 Dramatic, exciting and chaotic game viewing awaits as the wildebeest thunder across in their millions – and the action is all but on the doorstep of Sayari Camp. 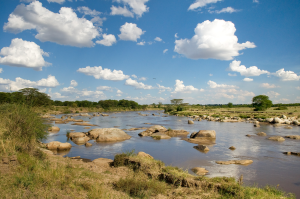 The Mara river, just a few minutes away from Sayari camp. 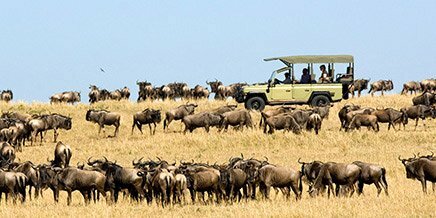 Once the migration has moved south, between December and March, the Northern Serengeti offers unrivalled exclusivity, with a mere handful of guests exploring this vast tract of wilderness – this is the ‘connoisseur’s season’, prized by safari veterans who value having Tanzania’s unspoilt wilderness to themselves. 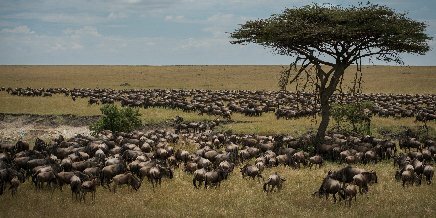 The grasslands are filled with large herds of plains game, followed by lion and cheetah ever vigilant for easy prey. 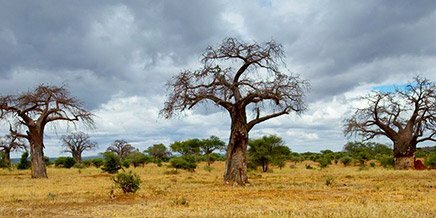 Leopards lurk in the lush riverine forest, and sightings of elephant and rhino are common. 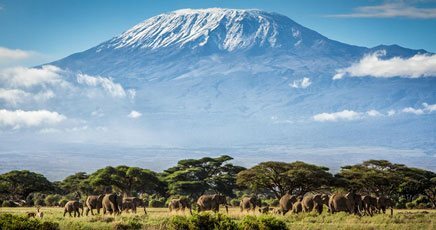 The arrival of the European migrants swells the resident bird population to over 500 species, making this a truly spectacular time to visit. 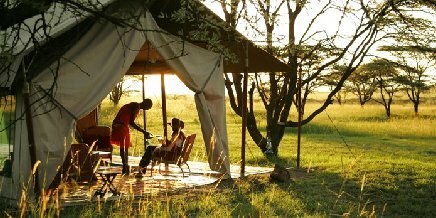 Days at Sayari Camp revolve around exploring one of Africa’s last great wilderness areas. 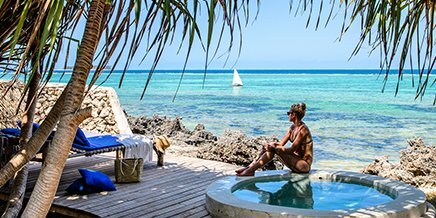 Whether you are looking for adventure and excitement or quiet contemplation and rest, Sayari – far off the tourist beat – has it all in abundance. 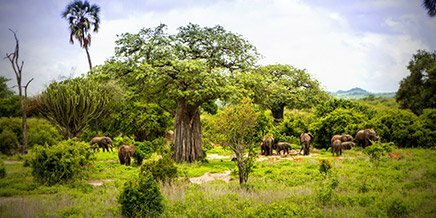 Our expert field guides offer daily game excursions in modern vehicles to get you up close and personal to the myriad wildlife species that call this wilderness home. 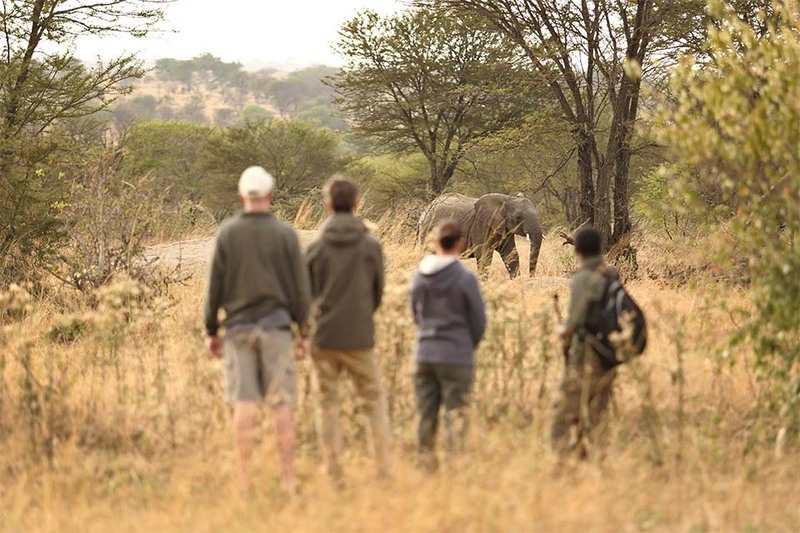 While we do have closed vehicles, for the best experience we strongly recommend our open game-viewing vehicles. All vehicles have power points where you can recharge your devices, and are fitted with fridges to keep your drinks deliciously frosty. 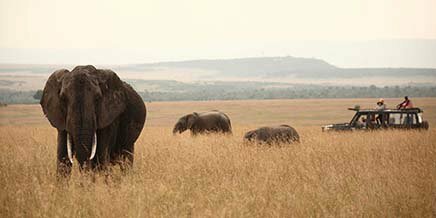 Discover the Serengeti on foot: our experienced guides lead walking safaris in the bush to add an extra thrill to your African adventure. 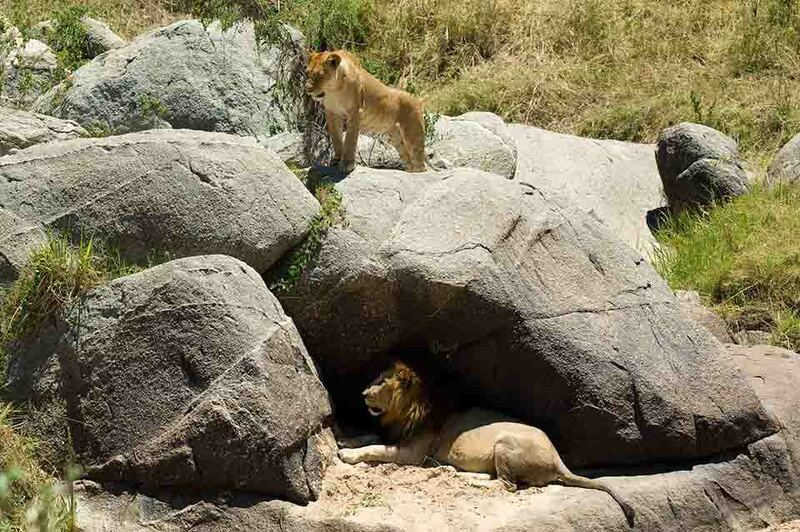 For a day of uninterrupted game viewing, take a packed breakfast or lunch with you on a game drive and enjoy it in the shade of the trees along the river. 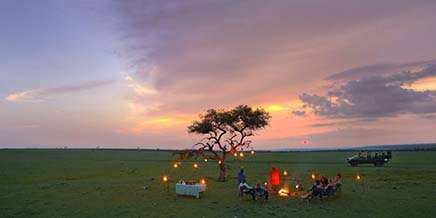 Private dinners can be arranged in camp, for an unforgettable dining experience under the African night sky. 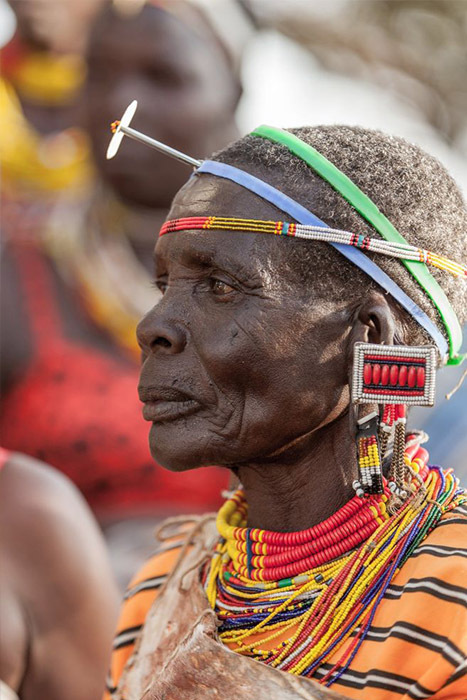 Visit nearby Merenga village to learn about the Kuria tribe, their culture, traditions and way of life. You can also stop off at the community vegetable gardens, mentored and sponsored by Asilia, to collect fresh produce for your evening meal. 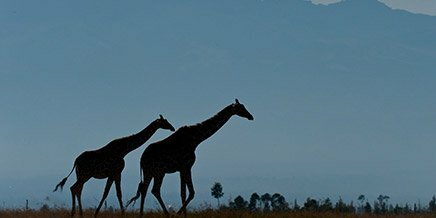 If time allows, you may want to skip some of the game excursions. 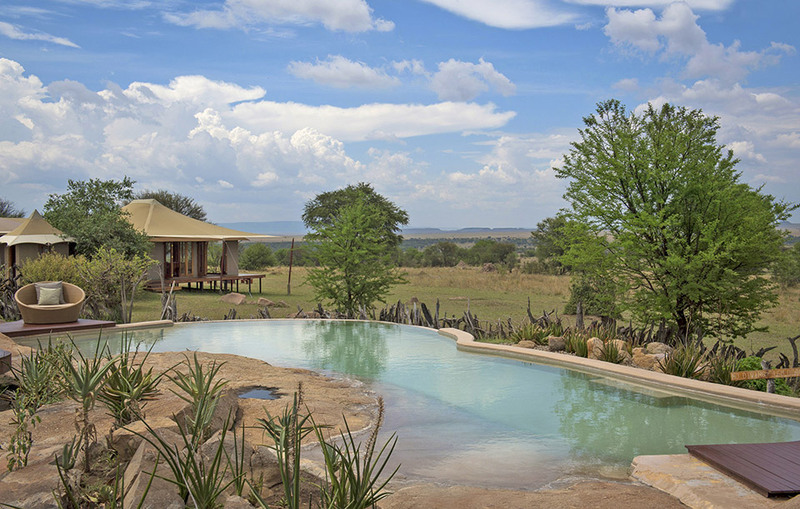 Spend the morning in camp getting reacquainted with a good book or sun yourself beside the rim-flow pool. 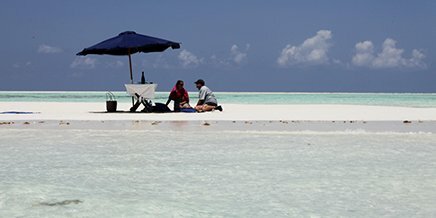 In the afternoon, indulge in a spa treatment from our expert therapists or savour a leisurely lunch as you scan the horizon for signs of the resident game. 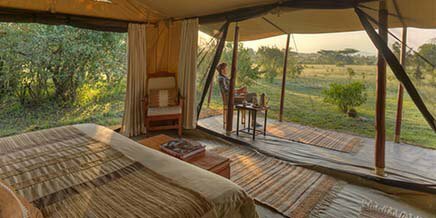 Sayari originally operated as a seasonal camp on the south bank of the Mara River, migrating to the Moru Kopjes in the central Serengeti from December to March. 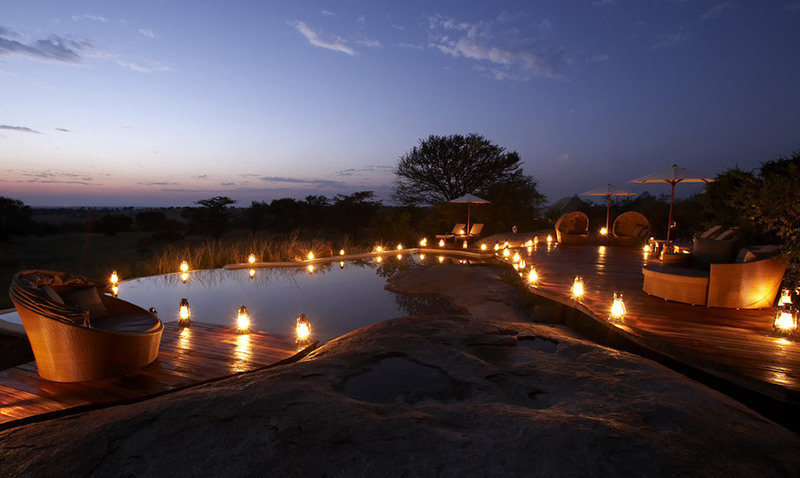 In 2009, the decision was made to build a permanent camp in the then under-explored plains of the Northern Serengeti, and Sayari as it is today was established. 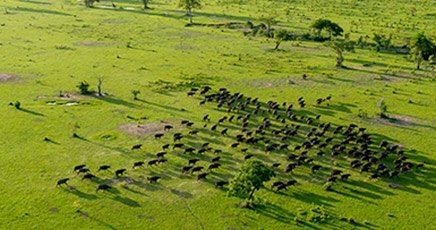 Sayari Camp has played a pivotal role in the long-term conservation of the northwestern Serengeti. 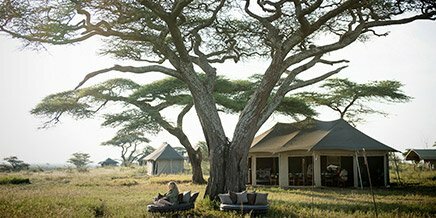 When Sayari first opened in 2005, the area was a hot spot for local poachers: with no other means of livelihood, villagers had turned to hunting the Serengeti’s abundant wildlife to make a living. 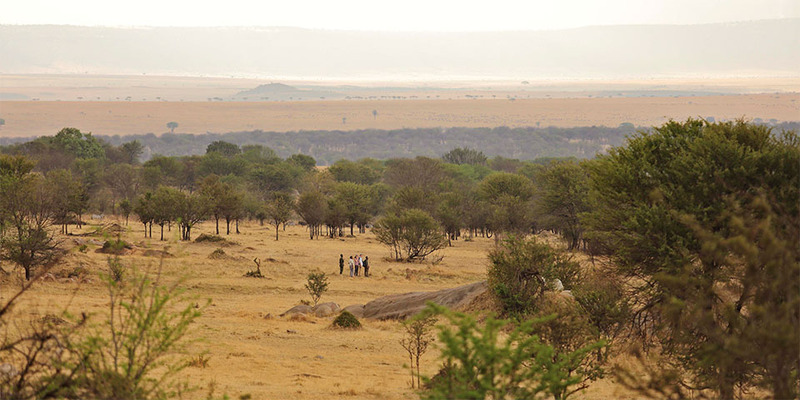 The arrival of the camp secured the long-term conservation of this area of the park and employment for the communities living on the park’s boundary. 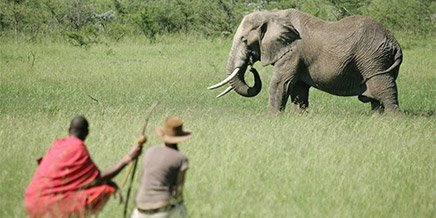 Now that tourism provides an alternative for villagers living on the borders of the national park, we’re happy to report that poaching is almost nonexistent. 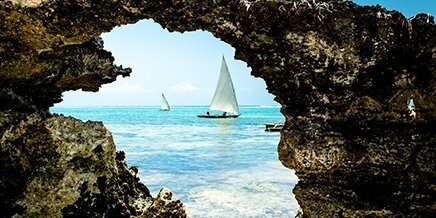 Sayari is recognised by Responsible Tourism Tanzania for integrating its working culture and daily operations into a sustainable and responsible management approach. 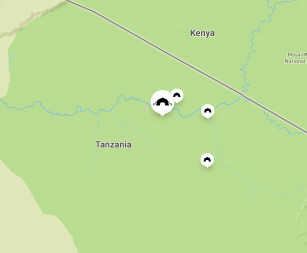 Systems are in place to monitor and direct operations. 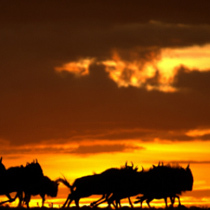 All employees understand the triple bottom line, which forms the core of the company culture. 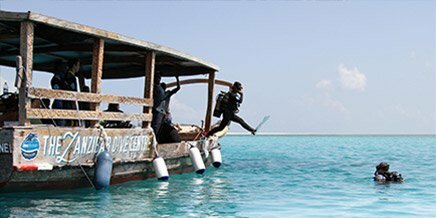 Sayari is also recognised by Fair Trade Tourism which benchmarks responsible tourism standards across the continent. Dining room tent exterior at Sayari Camp. Sayari Camp rock pool lit up at night. 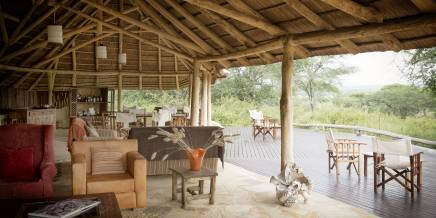 The beautiful pool area at Sayari Camp - with a visitor close by! 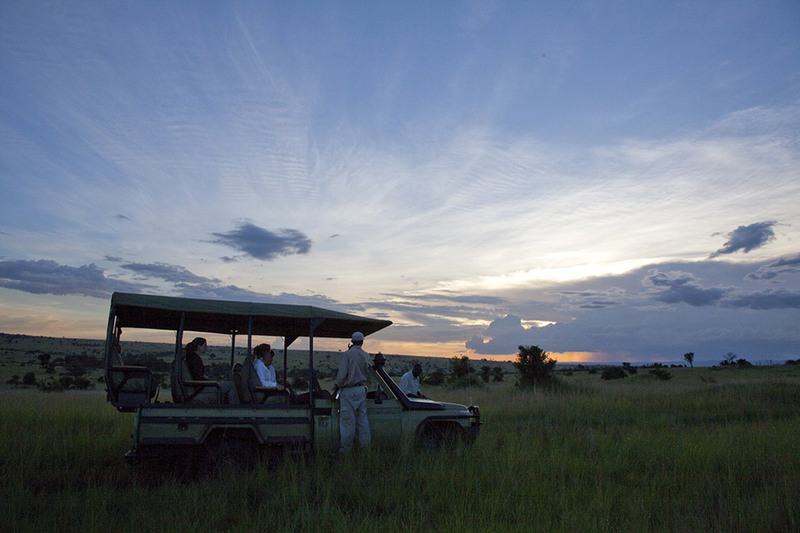 Guests enjoying a game drive as the sun goes down at Sayari Camp. 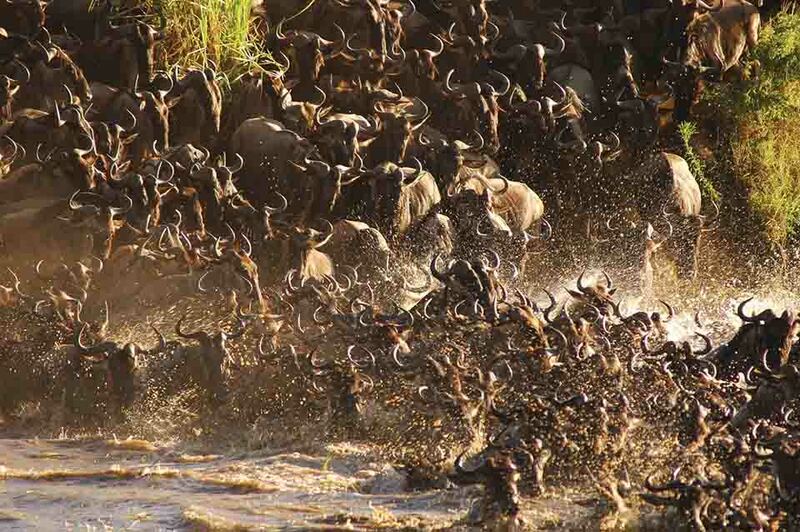 A close up of wildebeest migration crossing the Mara River near Sayari Camp. 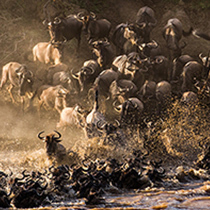 Wildebeest migration crossing the Mara River near Sayari Camp. 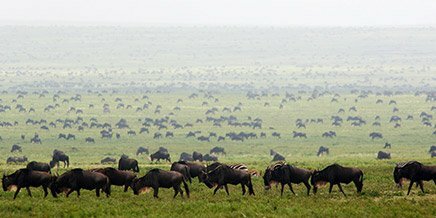 Wildebeest herds seen near Sayari Camp in the Serengeti. Come and see our Veggie Garden! 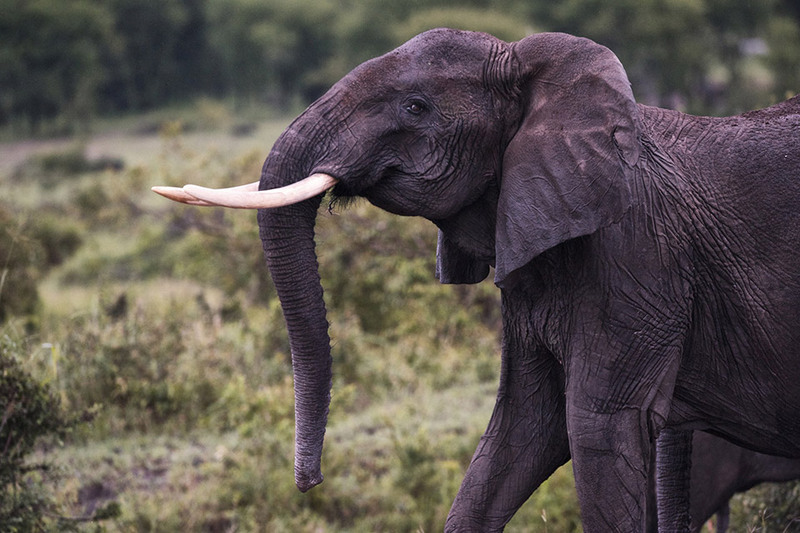 Tanzania safari elephant close up. 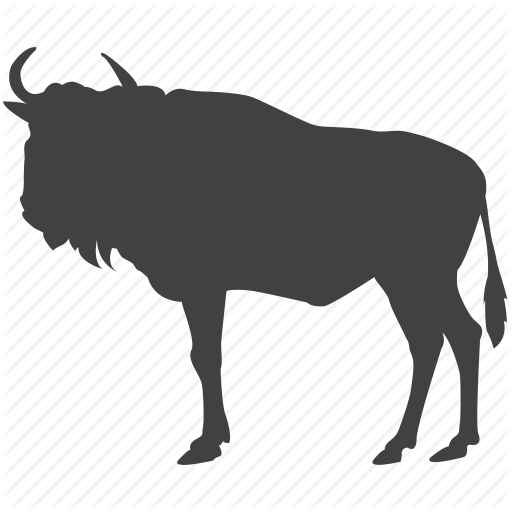 Buffalo seen near Sayari Camp. 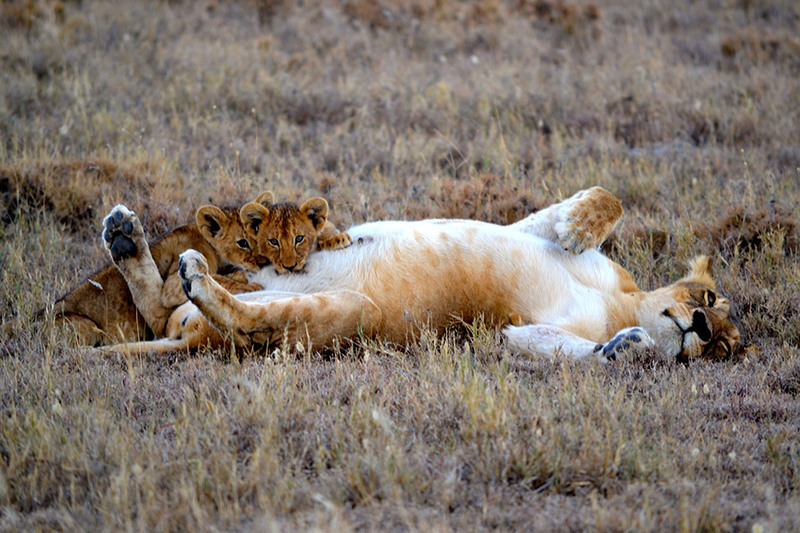 Sayari Camp lion cubs suckling. The Mara river sunning thought the Serengeti, near Sayari Camp. 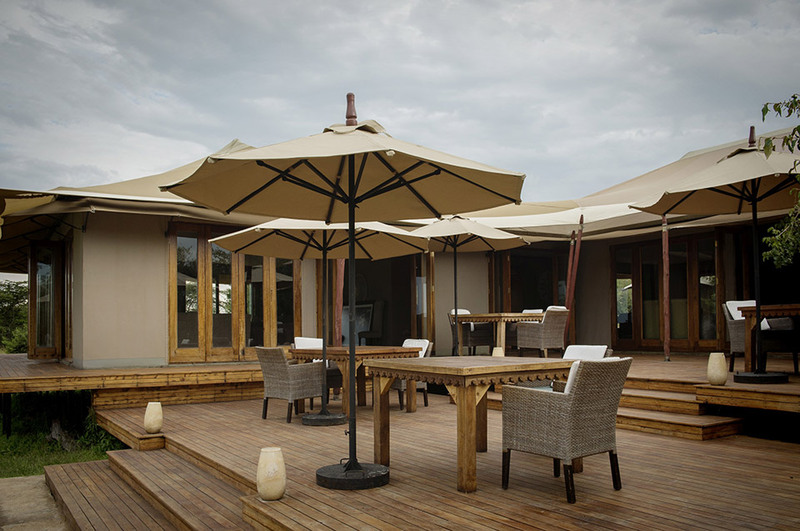 Outdoor dining deck at Sayari Camp. 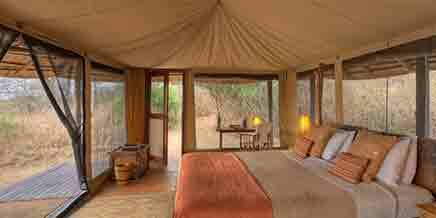 Guest bedroom tent at Sayari Camp.